Whether an active climate policy that reaches the 2 degrees warming target for 2100 can be enforced will depend to a large extend on the structure of the policy mix and the economic effects that are induced. This paper evaluates such policies and shows their direct and indirect economic and environmental effects till the year 2050 by applying the global economic environmental model, GINFORS. This model allows for a realistic analysis of policy impacts, as resource use and economic developments are reported in deep sector detail. The paper discusses two plausible policy scenarios that may be realized. The first scenario is called “Global Cooperation.” It assumes that a global climate treaty will be established, providing a commitment for the implementation of a policy mix that is able to stop global warming at 1.7 degrees by 2100. Under the second “Middle of the Road” scenario it is assumed that the international community fails to establish a climate treaty. As a consequence, this leads to uncoordinated action between the EU and Non-European countries, and subsequently, the 2 degrees emission path probably cannot be met. These two alternative scenarios are compared with a third scenario, “No active climate policy globally,” which is used as a baseline assuming a business as usual policy mix. 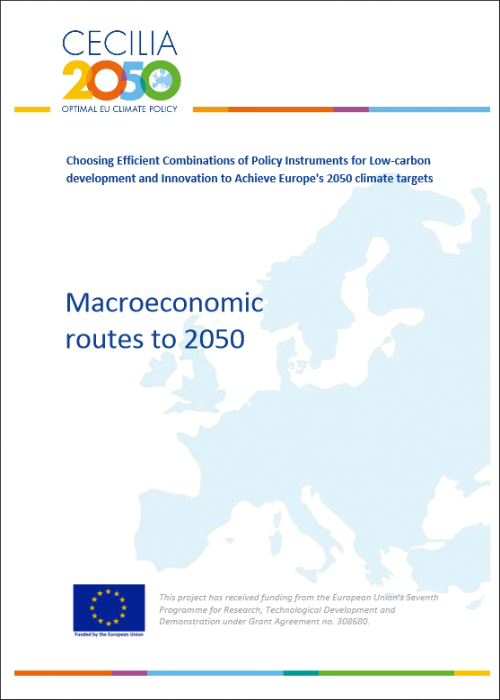 Concerning the future policy choice the study proposes a set of climate policy instruments for the EU member states and for Non-EU countries. The subsequent simulations with GINFORS show that, while it is not easy to reach the targets, it seems to be possible with the chosen policy mix. The study concludes that the proposed policy mix will induce a strong push on investment during the next decade if clear long-term commitments are made by policy makers so that investors have no doubt about the future perspectives of climate policy. The simulations have shown further that the technology change induced by the assumed policy mix in the investment dominated first phase till 2035 will create higher GDP values than in the baseline. After 2035 remaining capital costs and the costs of dematerialization will lower the growth rates slightly. But in total the sum of deviations is zero. A win-win situation is given, if a time preference is assumed. The general result of the study is that the targets can be reached with conventional technologies. Meyer, Bernd; Meyer, Mark; Distelkamp, Martin, 2014. Macroeconomic routes to 2050. CECILIA2050 WP3 Deliverable 3.3. Osnabrück: Gesellschaft für Wirtschaftliche Strukturforschung (GWS).